Spixworth Hall Cottages offers weekly bookings starting on Friday. The cottages are in an idyllic setting nestled in seclusion on the farm, with the most beautiful scenery right on your doorstep. the cottages are 500 metres from the nearest road and only 15 minutes from the city centre. There is excellent access to local attractions, rivers and lakes of the Broads, historic buildings, gardens, market towns and churches. The thoughtful and sympathetic restoration of the cottages and conversion of the old mellow Norfolk brick buildings has given quality holiday homes with much style and character but with the luxury of fittings and equipment of the 21st century. Norwich City Centre, Wroxham & the Norfolk Broads are just 15 minutes drive away. The beaches & coast are 30 minutes away by car. Cycle storage available. Village shops, Pub & takeaways are within walking distance. There is a regular bus service to Norwich City Centre, whilst the Broads and Coast are within an hour and a half drive. Children welcome from any age. 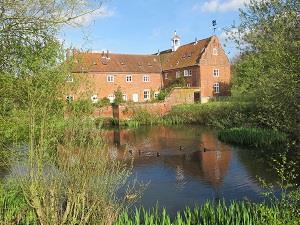 The best access to Spixworth Hall Cottages is from the A1270 avoiding Norwich. Take the A47 and Norwich Southern Bypass until you see signs for the A1042, Norwich Airport and then take the A1270. Keep on the A1270 until you reach the B1150 signed to North Walsham to the right. Take the B1150 and then take the first left onto Crostwick Lane. At the end of Crostwick Lane go straight across the Buxton Road onto the farm track - Old Hall Lane. Open the wooden gate and drive down to the cottages. Please note it is not possible to leave the A1270 directly onto Buxton Road. Detailed arrangements for picking up your key will be given with your booking confirmation. For the Lodge cottage, at the end of Crostwick Lane, turn left onto Buxton Road drive approximately 200 yards and you will see the cottage on your right, after an s-bend. From Norwich - 4 miles Nearest Station- Norwich Either take a bus from the station to the city centre-Castle Meadow-cross the road and find the No.10 bus stop. Buses run half hourly to Spixworth. Ask for The Longe Arms bus stop.